The University of Maryland along with several key partners released today new analysis and maps that reveal the alarming speed at which the world’s largest expanses of forest wilderness are being degraded. More than 104 million hectares—an area three times the size of Germany—of the world’s remaining Intact Forest Landscapes were degraded from 2000 to 2013. To view the Intact Forest Landscape mapping methods and findings please visit: www.intactforests.org. The University of Maryland, Greenpeace GIS Laboratory, and Transparent World, in collaboration with the World Resources Institute and WWF-Russia, used satellite technology and advanced techniques to conduct a global analysis to determine the location and extent of the world’s last remaining large undisturbed forests, called Intact Forest Landscapes. These are areas large enough to retain native biodiversity and contain no signs of fragmentation by logging and infrastructure such as roads, mining and oil or gas development. The work was performed at the UMD Geography department by UMD researchers (Svetlana Turubanova, Peter Potapov) and their Greenpeace colleagues (Ilona Zhuravleva, Anna Komarova). •Since 2000, 8.1% of Intact Forests Landscapes have been degraded. •Almost 95% of the world’s remaining Intact Forest Landscapes are in the tropical and boreal regions. •The largest areas of IFL degradation have been found in the Northern boreal forest belt of Canada, Russia and Alaska (47%) and tropical forest regions such as the Amazon (25%) and Congo (9%) basins. •Just three countries – Canada, Russia and Brazil – together contain 65% of the world’s remaining Intact Forest Landscapes. These countries also accounted for over half of all IFL degradation with road building, often linked to logging and extractive industries, being a key driver. Other drivers vary significantly in different regions, from man-made human-caused fires in Russia to agricultural conversion in Brazil. The areas covered in the analysis include some of the most precious landscapes on Earth, ranging from the vast northern boreal forests, home to caribou migrations and enormous quantities of stored carbon; the biodiverse rainforests of Central Borneo, the Congo and the Western and Northern Amazon. These last forest frontiers play a critical role in sustaining rich biodiversity, maintaining climate and weather stability as well as air and water quality, and supporting the livelihoods of forest-dependent communities. However, according to the new data, human activity – such as logging and road building – is fragmenting these pristine landscapes. This not only leads to increased biodiversity loss, but also intensifies climate change through the release of greenhouse gas emissions and loss of valuable forest carbon stores and sinks. “Our team developed the IFL concept and mapping method in the early 2000late 1990ss as a simple and practical tool for mapping and monitoring global forest degradation. Based on freely available satellite data, the method allowed us to map global intact areas for the first time. 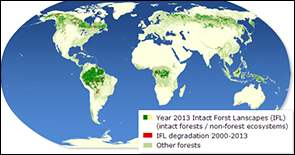 The year 2000 IFL map provided a global baseline for subsequent forest degradation monitoring. Today we present the results of 13 years of intact forest monitoring performed using the same data source and method to ensure globally consistent results. Monitoring data allows direct quantitative assessment and comparison of natural forest areas degradation at global and national levels. We believe that the global IFL map will help to spur practical conservation planning and action with regard to large undeveloped forest landscapes,” stressed Dr. Peter Potapov, Research Associate Professor, University of Maryland.